NEW YORK (CNS) — Forty-three summers ago (incredibly), Steven Spielberg’s “Jaws” made moviegoers afraid to go in the ocean, for fear of getting bitten (or worse) by a great white shark. That trailblazing horror film is child’s play compared to “The Meg” (Warner Bros.). Consider “Jaws” crossed with another Spielberg classic, “Jurassic Park,” and you’ll get the (very big) picture. Based on the 1997 novel by Steve Altern, “The Meg” proposes that the massive creature lurking in the deepest part of the Pacific Ocean is a prehistoric 75-foot-long shark known as a Carcharodon Megalodon — “Meg” for short. Fortunately for viewers, director Jon Turtletaub (“National Treasure”) and a trio of screenwriters (Dean Georgaris, Jon Hoeber and Erich Hoeber) temper the terror — and absurdity — of the premise with a welcome amount of levity. Still, Meg has a huge appetite, and the monster’s rampages will prove too scary for younger viewers. “Finding Nemo” this is not, despite the adoption of that film’s mantra, “just keep swimming,” by the hero, deep-sea diver Jonas Taylor (Jason Stratham). Jonas is called out of retirement for an emergency rescue mission. A mini-submarine piloted by his ex-wife Lori (Jessica McNamee) is stuck at the very bottom of the Pacific Ocean. Lori and her crew were exploring six miles down when their vehicle was attacked and disabled by an unknown creature. Turns out Jonas encountered the same monster five years ago when it chomped on a nuclear submarine, with Jonas barely escaping with his life. No one believed his story then, but they do now, especially billionaire Jack Morris (Rainn Wilson), who is financing the international undersea observation program. With the help of a comely oceanographer named Suyin (Li Bingbing), Jonas saves the day — and wins her heart, to the delight of her cute-as-a-button daughter, Meiying (Shuya Sophia Cai). But his success, unfortunately, allowed the Meg to escape the trench and find its way to the surface. The race is on to stop Meg before it can feast on tasty swimmers at beaches along the Asian coast. 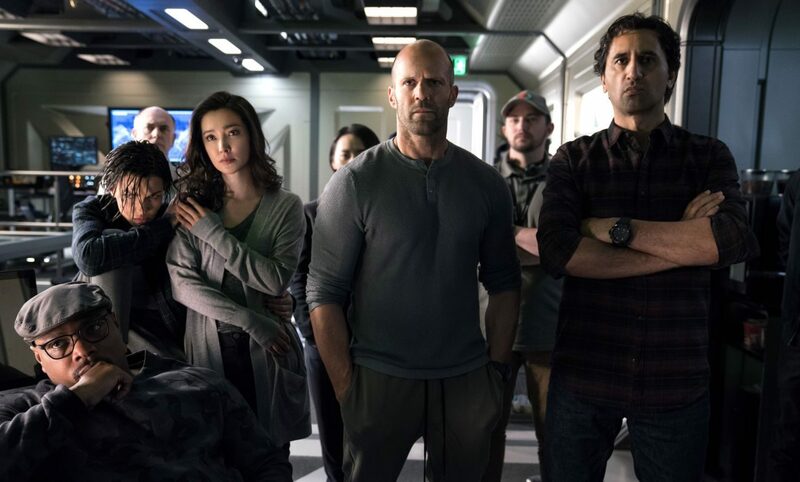 “The Meg” is swamped by silly dialogue like this, but one would expect no less in a summer popcorn movie that is pure escapist entertainment. The film contains perilous scenes of shark attacks, some gore, brief sexual banter, and a handful of profane and crude oaths. The Catholic News Service classification is A-III — adults. The Motion Picture Association of America rating is PG-13 — parents strongly cautioned. Some material may be inappropriate for children under 13.